Now I’ve gone through the five reasons why I think you should be using twitter for your farm business and I promised to show you how to set up a Twitter account in just a few simple steps. 1. 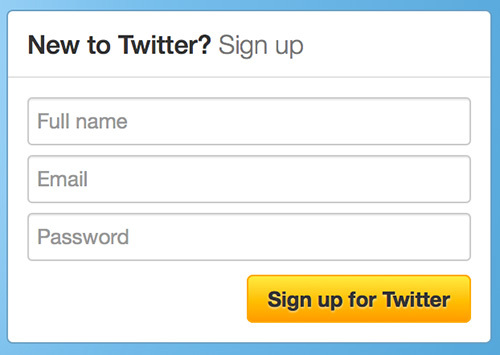 Go to Twitter and create an account. You don’t have to worry about creating the username just yet. Just fill in your name, email and password. I would recommend getting some photos and/or logo of your farm for the profile photo section right now. This name can be changed down the road but it’s a real hassle so choose your name wisely. 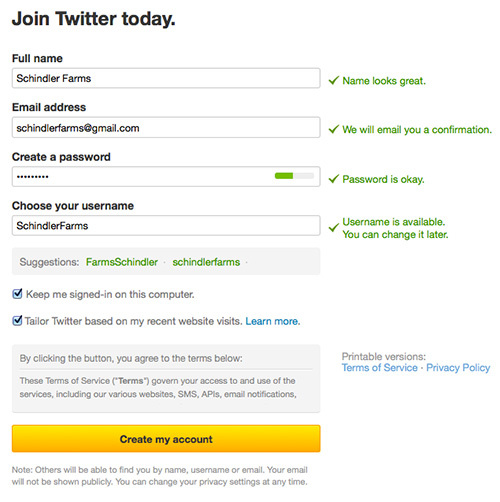 If you are doing this as a farm business account, I would suggest using your farm name like I did here with SchindlerFarms (there can be on spaces and I would avoid underscores or dashes.) If you have to change your twitter handle, you can change it via Twitter. If you are setting up a Twitter handle for a personal account, I would recommend using your name. It’s tough to build other names or brands that would represent you and in the long run, most anonymous accounts will be forced to be more transparent. You don’t have to do this, it’s just a recommendation. Then click Create My Account. 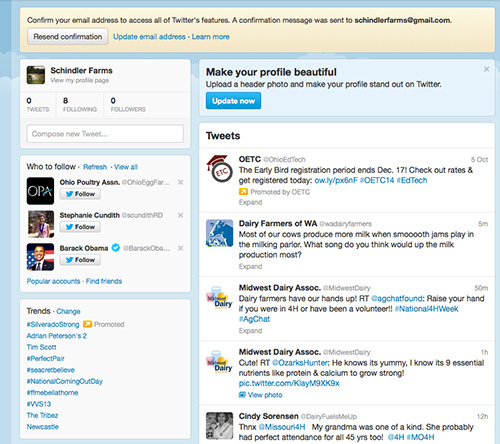 Your account is now live and twitter is showing you a sample tweet from The Twitter Teacher. 3. 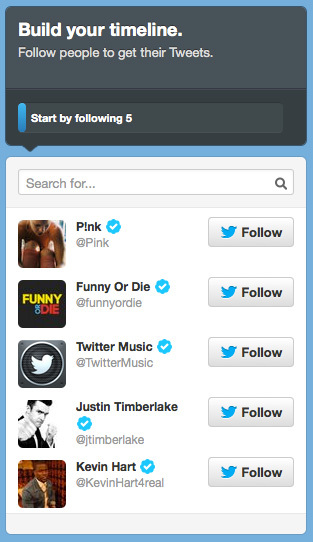 Twitter will prompt you to start following other Twitterers. These will most likely be people who are popular celebrities or entertainment brands who have paid to be here. You are more than welcome to follow them if you wish. You would do this by clicking Follow next to their names. The blue checkmarks mean that these accounts have been verified by Twitter to be real. Not everyone on Twitter is verified. 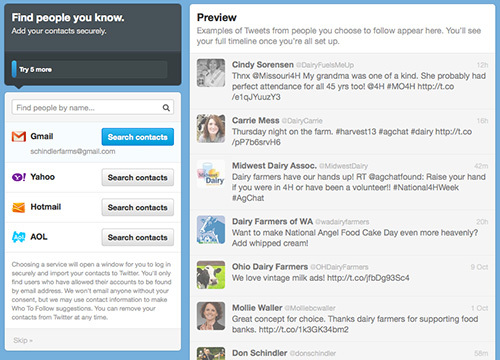 I would suggest skipping this and using the search box to find people you want to follow. 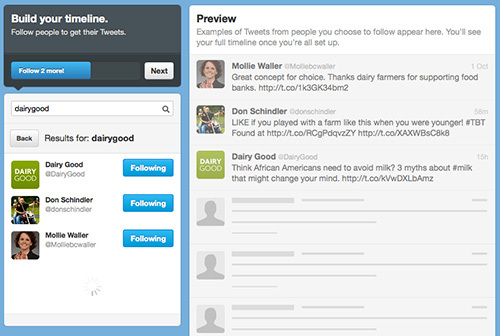 For instance, I put in the term “dairygood” into the search field and got back a few people. As you can see, there is Dairy Good, me and Mollie Wallers (chief communications officer for Dairy Management Inc.). 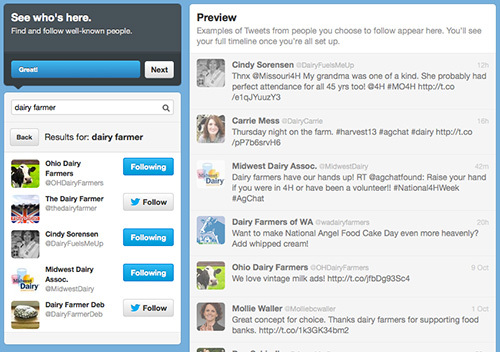 Of course, they would like you to follow more (when you click Next) so I put “dairy farmer” in the search box and up comes some more people to follow. As you follow more people, they get added to your timeline in the center of the screen. You will see everything they tweet (this isn’t like Facebook where the algorithm decides who you see). If you are looking for dairy farmers to follow, I recommend @rayprock, @_sdmaddox, @dairycarrie, @gilmerdairy, @ezweber, @zweberfarms, @nyfarmer and @TrentBown. There are many, many more and you can follow my whole list of farmers is getting big out there on twitter. When you start following people, you need to use the Twitter Lists function to help divide people into separate listening streams. I will do a follow up posts on using Lists and other tips and tricks to make the most use of Twitter. Click the Next button to most pass the search and follow feature. 4. Twitter will want you to connect your email to find them on . I don’t recommend this. There’s a small light “Skip” link in the bottom left. I would click that and move along. 5. Add your profile pic and your biography information. Now this is very important because this is one of the ways people will find you. The image will help people see who you are. I recommend a farm shot or your logo – make sure the logo is already in a square image. I matched the profile pic to my profile pic on Facebook for branding. 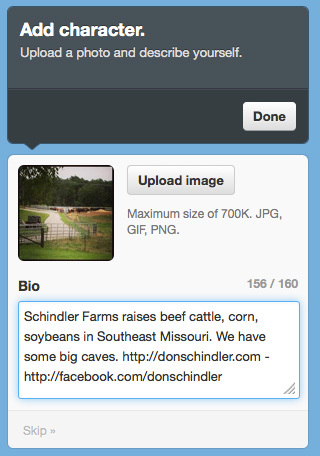 UPDATE NOTE: Tim Zweber of @zweberfarms recommends using people profile for farm photos and I agree. People like socializing on Twitter with people. Put a face on your farm. You also have room to put in your biography text of 160 characters. I put in the name and basic keywords if people would be looking for a farm in southeast Missouri. I would recommend putting in your websites and other social links. You can also hashtag things here as well if you want Twitter to pull in your profile into hashtag searches. I didn’t do that here but you can. If this is a personal Twitter account, I recommend using “Views are my own.” to help protect yourself from issues with FTC and advertising. It helps people understand that you are not intentionally tweeting information that could be misconstrued as advertising for your business or farm. All your employees, especially if they share information over Twitter about your business, should have that on their profiles. They should also mention that they work for you like my profile example. 6. According to Twitter, you are all done. But not me. Let’s make sure our Profile looks nice and add some more information. Let’s click on the “Make Your Profile Beautiful” or if you closed it, just click on the little gear icon on the top right by the search bar and go to Settings. Once on Settings, click Profile. Here you can add a header photo, your location, and your website again. Do NOT click Facebook Connect. You don’t want your tweets automatically going to Facebook. If you want to control both profiles from one application, I recommend Hootsuite and you can set that up using this my post, Top Reasons Why You Should Be Using Hootsuite For Your Farm. Now I know I didn’t get into how to communicate on Twitter, that will be a post coming up along with the tips and tricks. Did I miss any steps that you would add for the initial set-up?